나와 이 가칭 독수리 용사들과의 첫 번 대화는 대체로 성공적이었다고 할 수 있었다. 우리는 어느덧 서오릉에 닿았고 이제 이 꼬마들과 헤어져서 나는 학생들 틈으로 돌아왔다. 물론 이따가 한 번 더 만나기로 약속해두었다. The first conversation between the so-called "Soldiers of the Eagle Corps" and me could be called a success. At last we arrived at Seo-o-reung, and I parted from them and returned to my students, of course, having promised to meet again later that day. 문학회원들과 함께 우리 일행은 널찍한 잔디밭에 자리를 잡고 둘러앉아서 점심을 먹으며 놀고 있었다. 학생 중의 한 명이 잔디밭이 씨름판에 안성맞춤이니 누구 한번 씨름내기를 해보자고 서두를 꺼내자 엉뚱하게도 내가 그 씨름의 상대로 지목되었다. 평소에 나한테 구박을 한 번씩은 받은 녀석들이기 때문에 그들이 일제히 나를 지목하여 골려보려는 저의는 잔디밭의 봄 소풍에 썩 잘 어울리는 놀이이기도 하였다. 아마 나를 자꾸 귀찮게 끌어내려는 녀석이 권만식이었다고 기억이 되는데, 나는 그때 저쪽 능 옆에서 우리를, 특히 나를 지켜보고 있는 예의 그 여섯 꼬마들의 얼굴을 발견하였다. 이 꼬마들도 나의 곤경을 주시하고 있는 듯한 얼굴이었다. I sat around on the grass with the members of the literary club, having lunch and chatting and enjoying ourselves. 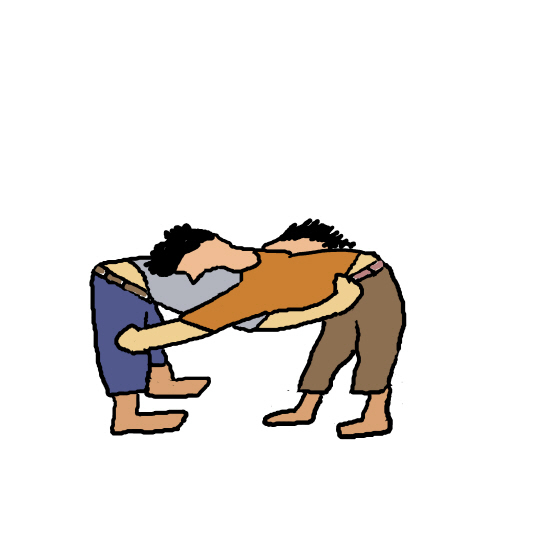 One of the students suggested a wrestling match since the grass was well taken care of, thus good for wrestling, and to my surprise, I was chosen as his counterpart. Since they all had been scolded by me, at least once, the suggestion of choosing me was welcomed and thought befitting the spring picnic on the grass. I remember the student who targeted me was Kwon, Man-sik. Then I noticed the faces of the six kids watching us, nay 'me' in particular, beside the tomb over there. They seemed to pay a keen attention to my hardship.